1. IT’S DONE! We’ve known for years that we would need to remodel the bathroom because the pipes were clogged and we couldn’t use the sink. (Yes, we had multiple plumbers attempt to fix it but they all determined that the wall would need to be removed to access the pipe.) So, after several years of brushing our teeth in the main bath, we can finally use our sink again and for that alone, I say Hallelujah! 2. WALL-TO-WALL COUNTERSPACE. Our old vanity was tiny (offering only an inch or two on the sides) so it made any basic task, like putting on makeup, extremely difficult. 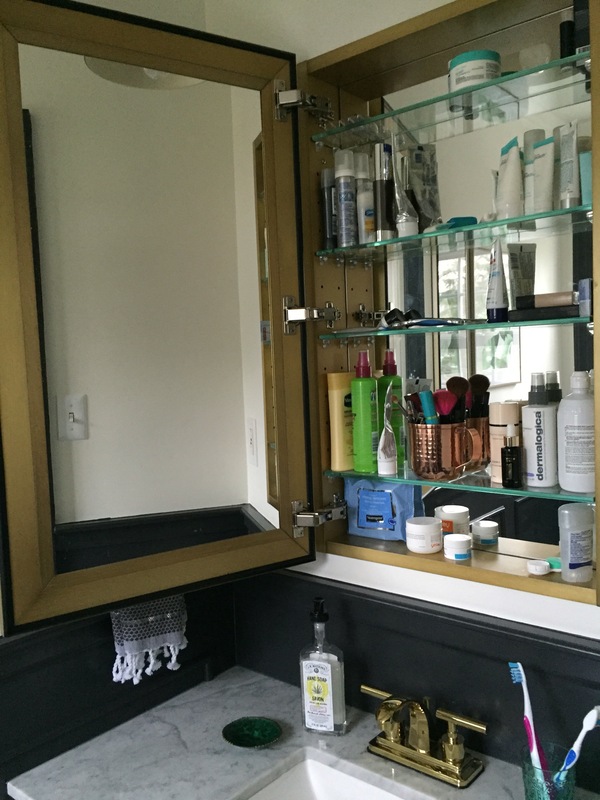 Even with all the pretty things in the new bathroom, the counterspace is probably my favorite feature! To have a daily task simplified like this feels like a great luxury to me. 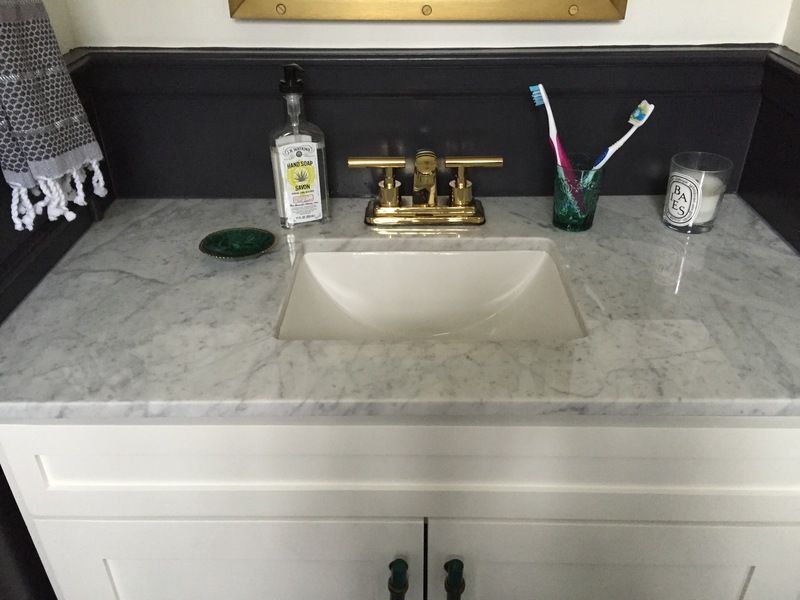 Oh – and did I mention that we lucked out by finding a pre-fab marble countertop at Home Depot that fit perfectly? 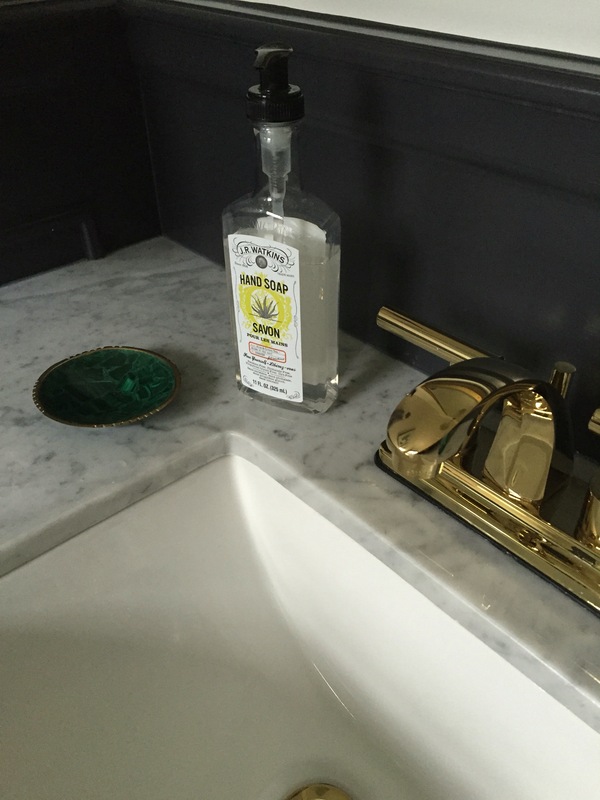 It came with the sink and was a fraction of the cost of a custom marble top! 3. ART. 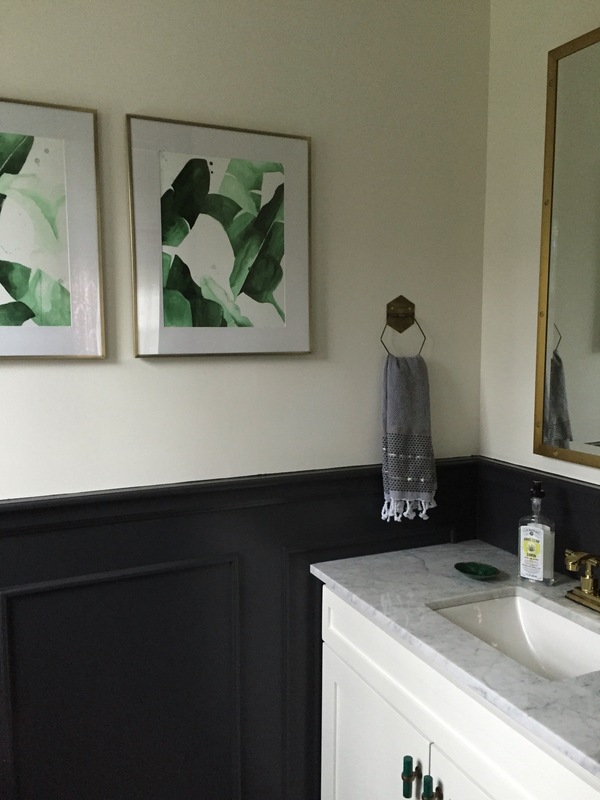 I always knew I wanted some green in the bathroom and even considered banana leaf wallpaper but when I saw these prints from The Aestate (they’re the Beverly I & Beverly II trimmed to fit the frame), I knew they were perfect. 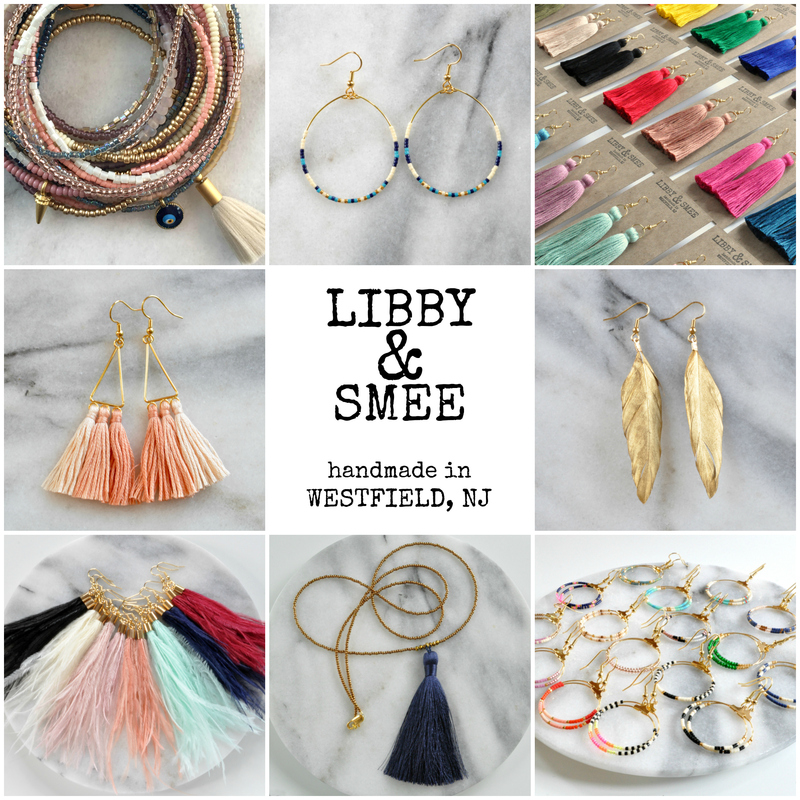 (Bonus: they’re cheaper and less of a commitment – perfect for my fickle taste!) 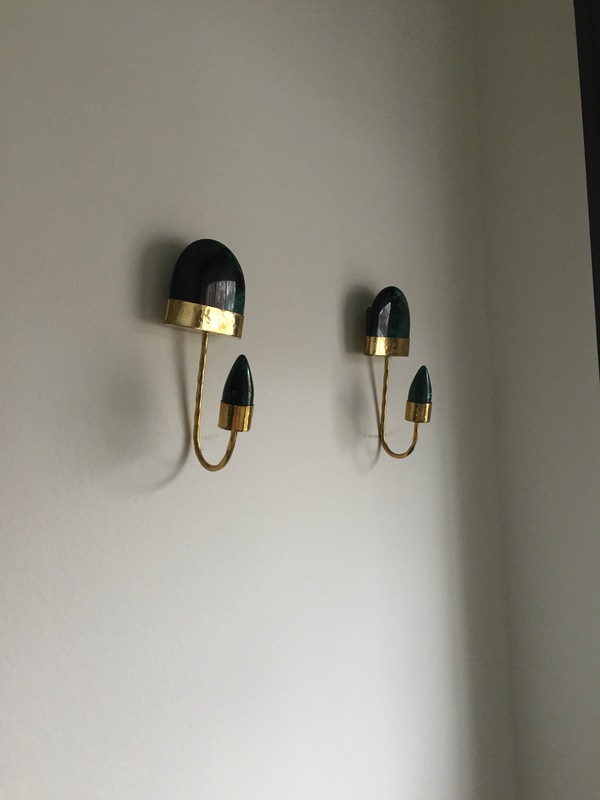 Note: The frames are from Crate and Barrel and the wall color is Benjamin Moore Cloud White. 5. CERAMIC TILE. I’m obsessed! Isn’t it beautiful? I’ve got to give credit to Pablo on this one. (It’s the Circulos Black from Cement Tile Shop.) 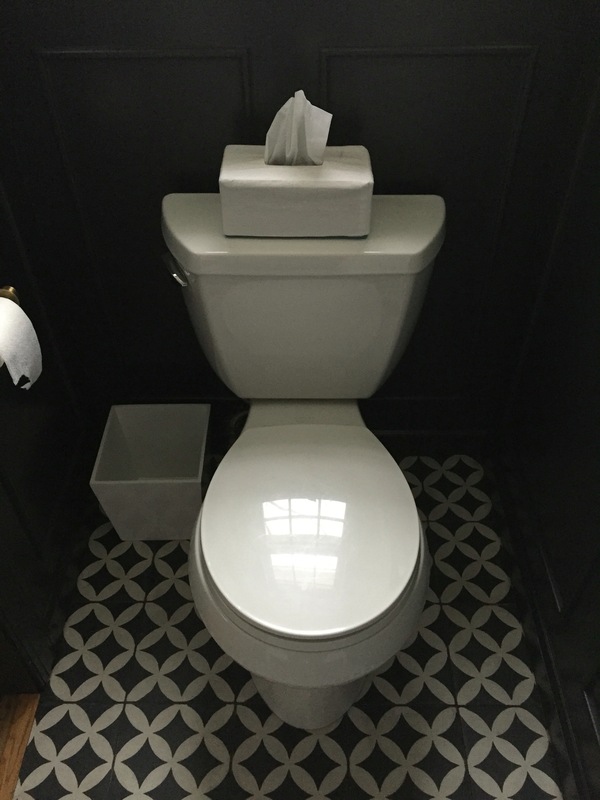 We were considering some classic small hex tile and he spotted this on my Pinterest board when I was showing him something else. Note: Our contractor had a lot of trouble with it. 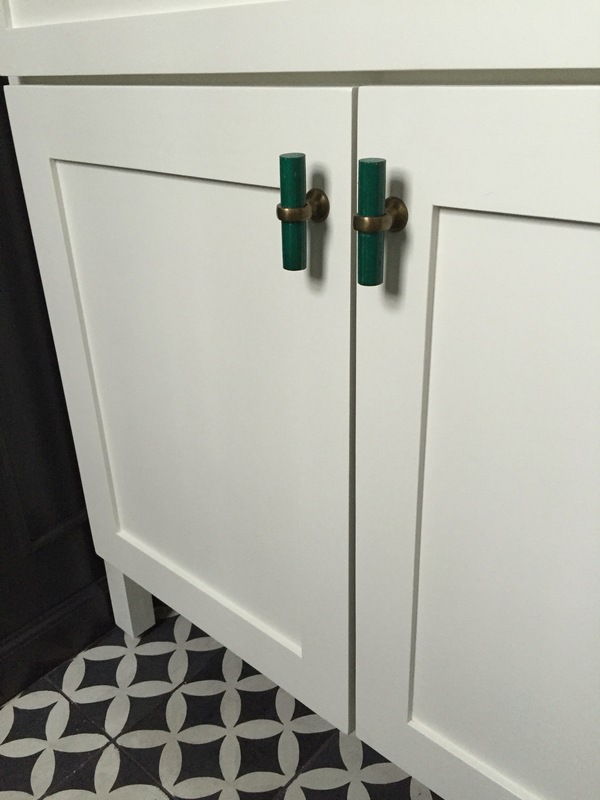 The dark grout stained the tiles and he had to buff them to get back to the correct color. 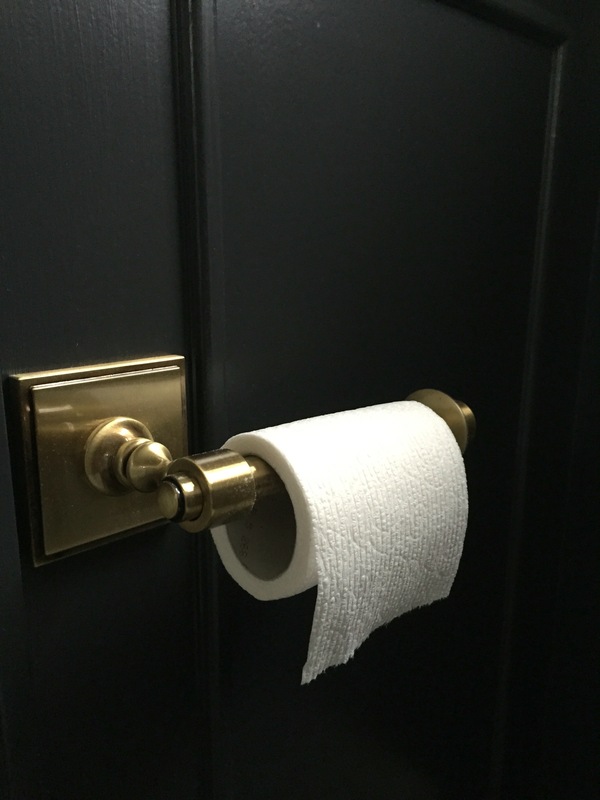 So, please – if you ever use this kind of tile, be warned! 6. 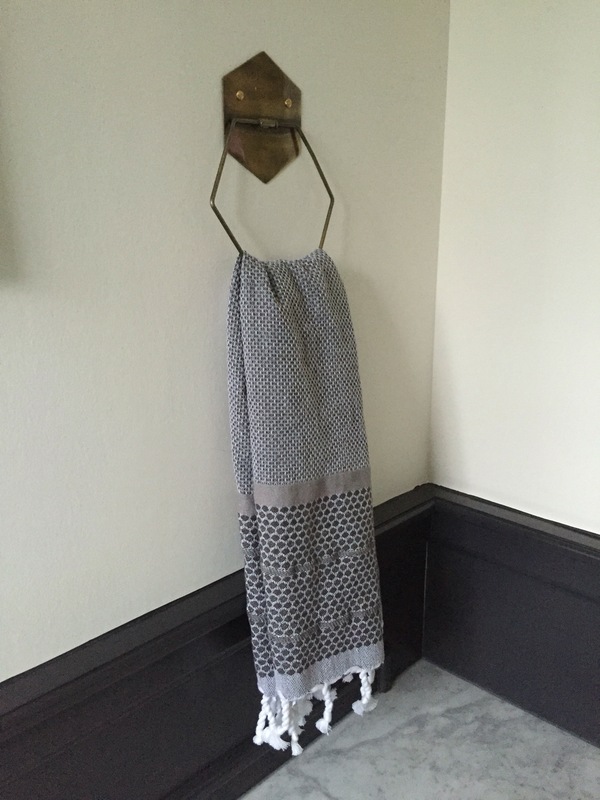 PRETTY TOWEL HOOKS. They’re from Anthro. Cute, huh? 9. 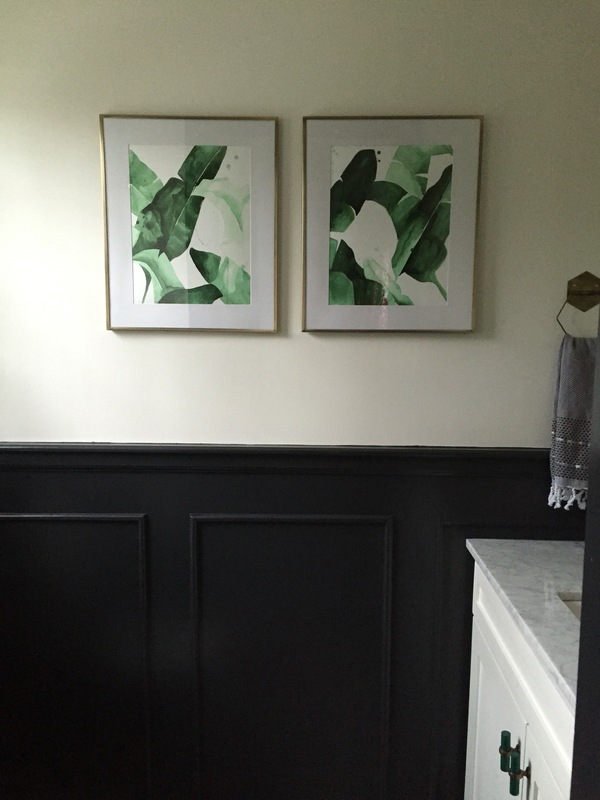 WAINSCOTING. 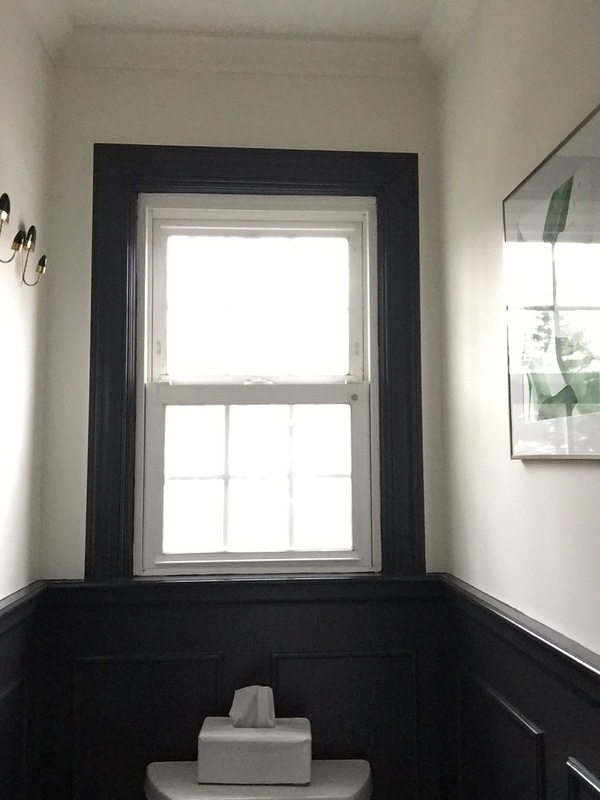 I originally wanted white subway tile in here but I’m so glad we decided to switch to wainscoting. 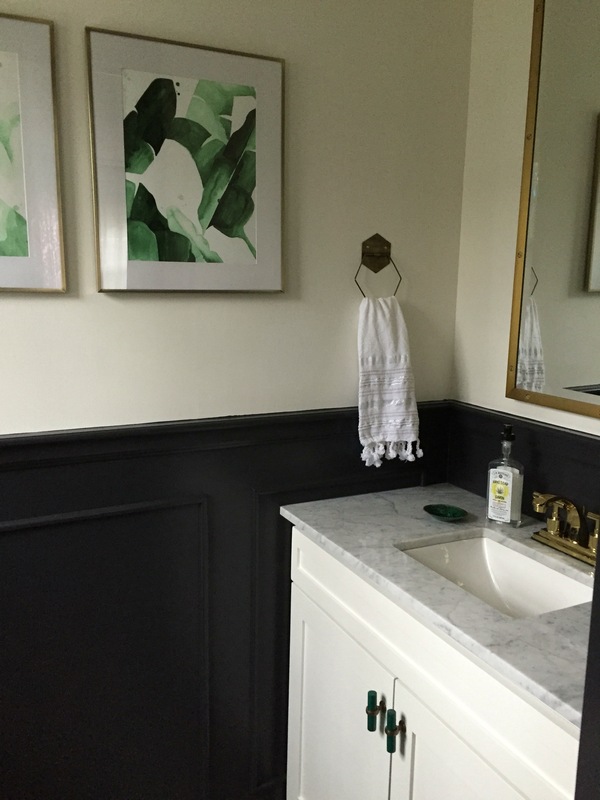 It looks classic but the dark paint (Benjamin Moore Black Jack) makes it modern. 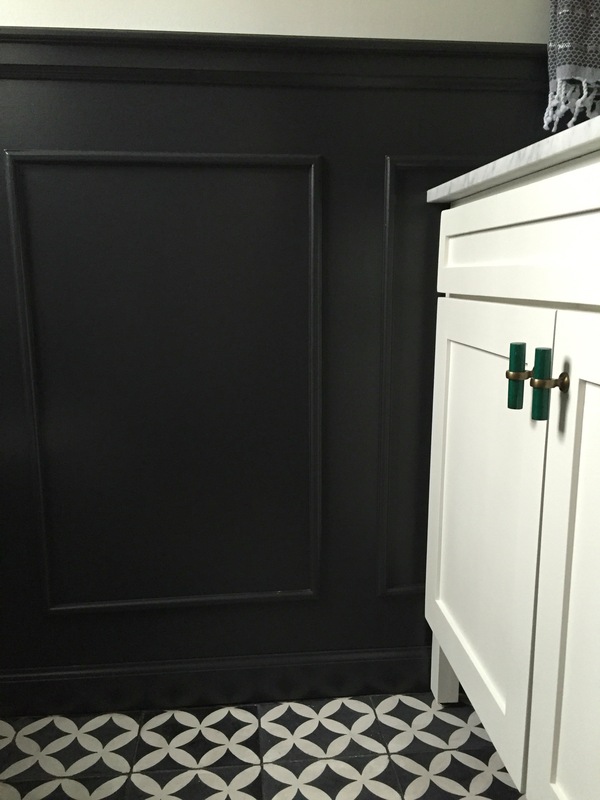 Get this: our contractor MADE every piece of trim. He’s amazing! 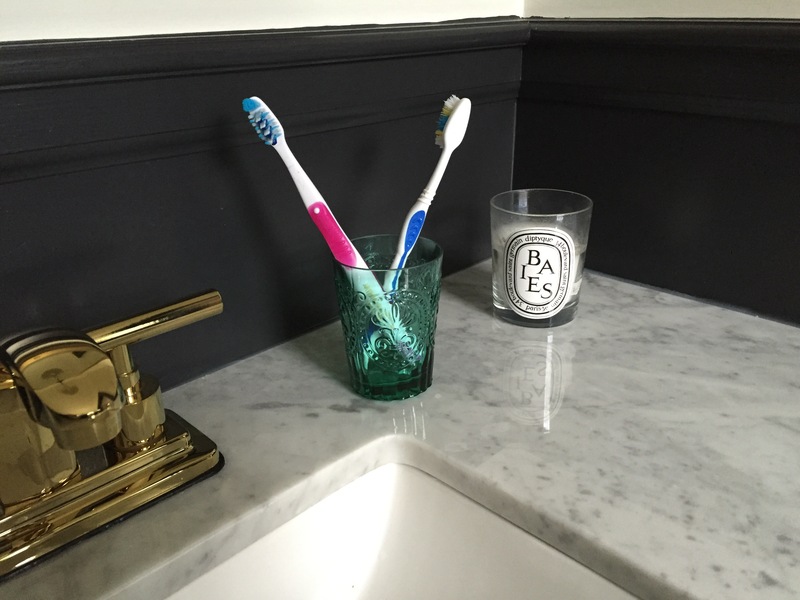 We keep our toothbrushes in a green glass from Anthropologie. And of course we have a Baies candle cause, duh, it’s the best candle on earth. 12. A MASSIVE MEDICINE CABINET. 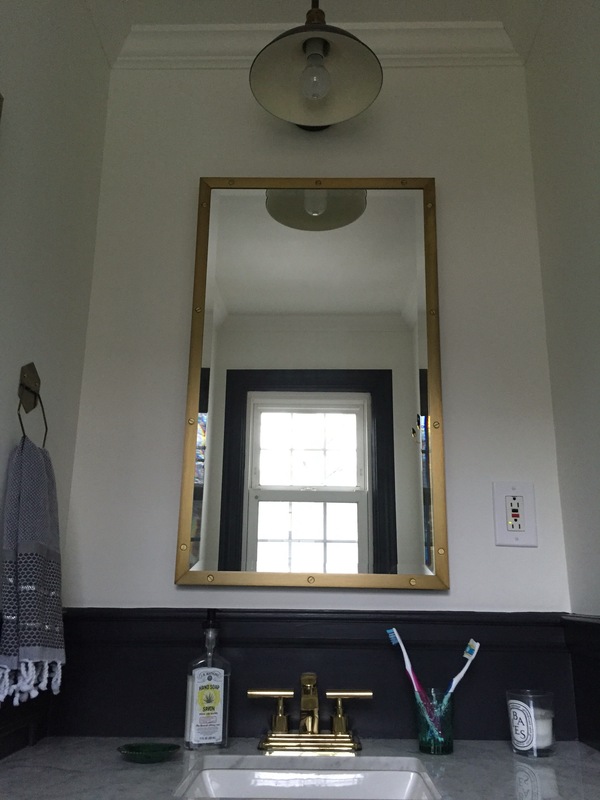 We fell in love with the Rivet mirror/medicine cabinet from Restoration Hardware and having it inset makes the bathroom feel so much bigger than before. Plus it’s pretty and offers TONS of storage inside (so much that I even let Pablo have some)! Do you hear the angels singing? Because I do every time I open it! 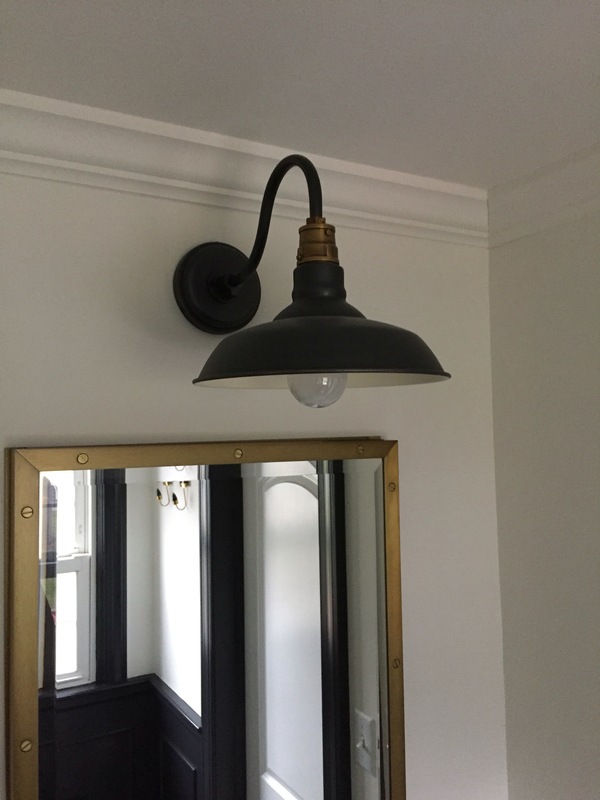 Very Chic, nice job Sue! Hi, I'm Sue and welcome to Sue At Home.